PLACE is an international interdisciplinary creation-research project. Selected researchers and artists from various disciplines investigate space-place dynamics and how different factors influence the construction and perception of sociocultural identity. 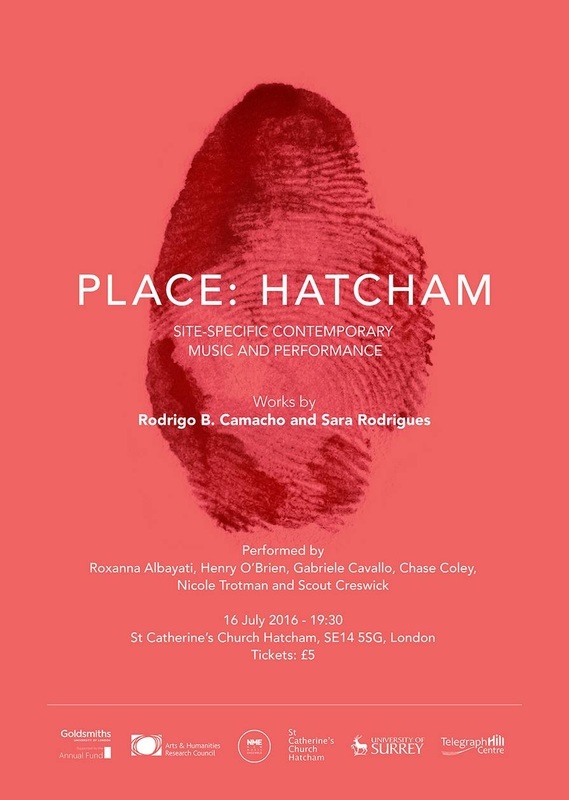 PLACE | HATCHAM was projected as part of the Music Composition as Interdisciplinary Practice, a research-creation network created by Tom Armstrong, professor and researcher at Surrey University - Guildford, with funding from the Arts and Humanities Research Council (AHRC). The selected place was St Catherine's Church through which composers became closely involved with the community of Telegraph Hill and devised two pieces of music and performance art about the area and its sociocultural richness. In "CONCORDANTIA DISCORDANTIA CANONUM", Rodrigo concentrated on eight dichotomic cases that he found tightly related to Hatcham's several histories and presents. Each case was placed in space against its opposer and, pair after pair, the whole piece developed a physical conversation around the audience as much as it did with the church's architecture. The cases were presented as follows: Pair I: Case A: Haberdashers Estate, Telegraph Hill Conservation Area and Case B: Allan Auckland's Vision and the Brutalist Intervention; Pair II Case A: Apostolic Constitution, Sacrae Disciplinae Leges and Case B: From Gratian to Sheridan, Women Ordination; Pair III Case A: Freedom or Death, 20th Century Feminism and Case B: The Ordinary Woman, 21st Century Feminism; Pair IV Case A: Multiculturalism, Nigerian Opposition to Gay Marriage and Case B: Hope Over Food, Nigerian Traditional Lunch. The piece was thus an exploration of how several different communities made different senses of their spaces, times and histories and therefore related to each other's discrepancies in very complex way between conflict and construction. About this, Rodrigo wrote that "contradictions are part of life, but in this place, it does not seem strange at all that something can simultaneously be singular and plural, past and present; that one can be pacifist and militant, conservative and progressive all at the same time. This is the space for oppositions to be exposed; for neutrality to fall, for tension, collision and conflict to be allowed; for discussion, negotiation and resolution to be encouraged; for permeability, contamination and coexistence to be the aim." "Where is the Person with Sixteen Parts?" An identity can be thought to be constructed by the sum of its parts, yet these are never stable, they’re ever changing. ​When we examine an object phenomenologically, its qualities are modified every single time we look at it according to its placement in time and space. The title of the piece is taken from the last question in the Prashna Upanishads, sacred writings used in the teachings of yoga. However, the practice of postural yoga, currently offered by the Telegraph Hill Centre, has had its meaning appropriated and redefined throughout the centuries. Yogins practiced postural contortions in meditation, yet these were once considered austere and regressive. Comparably, Saint Catherine of Alexandria also welcomed martyrdom through pain and torture in the name of her faith and beliefs. Is it still possible to think simultaneously of the sacred, the profane, the authentic and the other? St. Catherine's Church is an embodiment of this impossibility of a cohesive, singular entity. Parts often collide and dissonances occur; yet new possibilities and encounters are prone to take place. By turning friction into fusion, a contorting exquisite shape may be created. The work features a collage of various pieces collected through suggestion and research on the history of the place. Super-imposition and transparencies occur after the breakdown of parts into fragments, sixteen in this case, allowing for a deeper understanding through combinatorial possibilities. From the Latin religare: "to tie, to bind together, to make sense of".